With over 25,000 sq ft of warehousing space, we can offer hundreds of items from stock for immediate delivery, usually delivered on our own fleet of vehicles. For a closer look at Essex Packaging take a look at our Google Tour. We have now moved our print and embroidery machines into our Basildon warehouse so we can offer an even more competitive service. If you are planning on fitting your staff out in corporate clothing get in touch for a free quotation. 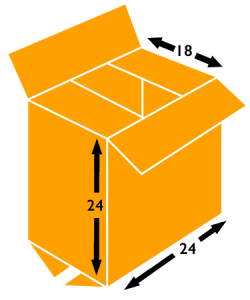 Recently added to our large stock range of popular boxes is a 24x18x24″ Double Wall 0201 Style Carton. This modular box fits nicely on a standard pallet and fills the gap between our 24x18x18″ and 24x24x24″ cartons. There has been a lot of talk and publicity in the last year or so about how we must move away from plastic products, with pulp and paper offered as the popular alternatives. Both have environmental benefits and limitations. Paper is usually considered to be the environmentally friendly option but you may be surprised that this isn't always the case.